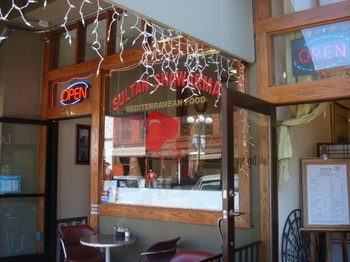 Sultan Schawarma-Excellent Eating Downtown - mmm-yoso!!! mmm-yoso!!! is the blog, written by Kirk and a few friends. Today, Cathy has a post about a great place she found downtown. Greetings and I hope all of you are having a nice day. Literally a hole in the wall in the middle of a bunch of many (and more expensive) restaurants... It looks like this through the front window. When it is open, the spits on your right are filled with cones of layers of beef and chicken schawarma, which were marinated overnight in yogurt, lemon juice and garlic (along with salt, pepper and I believe some sort of red pepper or pepper sauce) topped with a large whole onion and tomato... As you can see, the menu is short, simple and straightforward. Oh, the food here is great. Always fresh. I come here kind of regularly and so took some surreptitious photos of a few items. There are three tables out front and seating for 14 inside. People rearrange the tables in the back to suit the situation. The beef schawarma sandwich. 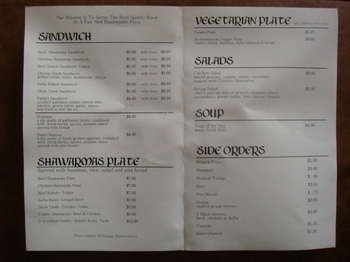 ($5.95-as are all of the sandwiches)(the side of fries is $1.95). Juicy, tender deeply flavored, thinly sliced beef that was cooked on the spit in front a direct heat source (in other countries, the meat is cooked on the spit in front of an open flame. San Diego has all sorts of 'laws' disallowing such craziness inside of buildings) for hours. 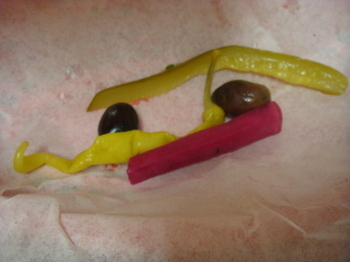 Served simply on freshly warmed flat bread, with lettuce, raw onion and tomato... and all the sandwiches are served with the optional add-ins of sliced pickle, banana pepper, pickled turnip and two olives. I have particular cravings for the chicken schawarma as of late. The chicken is always plentiful and very juicy and has just the right spices for my taste. The kefta kabob is sometimes on my craving list also and is a delightful mix of ground beef and spices (parsley, cilantro,onion, cumin, paprika, salt and pepper). If you get the kebab later in the day, though, sometimes it is dry...so I ask for a side of hummus (1.95-fresh made and comes with flat bread) to complete this sandwich...(and instead of fries, of course). I must say the sandwiches here do not *need* any sauce added- when the meat is sliced off the spit, it falls into the juices that were rendered and that flavor, along with the tenderness the juice gives to the meat, is perfect. If you happen to come here when the soup of the Day is lentil, get it. It is *absolutely* the most wonderful homemade soup *ever*...it does cost $3.50 and is worth it. Oh, and get the hot tea ($1.25) as your beverage- ask for it to be made strong-the flavor absolutely matches the food...the only other beverages offered are in cans and bottles. The place is owned and run by a very nice Iraqi family, who seem a bit guarded in keeping things private- in that , they bring you the food and then don't ask you "how are you doing?" and stuff like that. If you need something, you do have to ask. Just know they are willing to accommodate you and are very nice. If you are just walking on the sidewalk, you might miss it. Here is what it looks like up close. The hours on the door state they are open until 3 a.m., but that is usually when there is an event downtown, or the Padres are playing...I have seen it closed at 10 p.m....and since I believe the Padres are mathematically eliminated, the Fair Weather Fans who usually would hang around late are not hanging around downtown. Come here early in the day. You will like it. 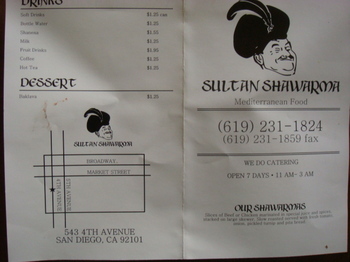 Sultan Schawarma 543 Fourth Avenue San Diego 92101 Ph (619)231-1824 Fax (619) 231-1859 Open 7 days 11 a.m.- 9 p.m. at least...sometimes later. This is a great post. 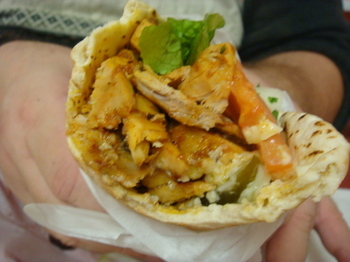 Shawarmas (sp) are such a great sandwich item and I wished more people knew about them. I was introduced to it in Westwood, Los Angeles. There was a great shawarma place that had great lamb, beef and chicken but what was the best thing about this place was its super hot relishes and pickled peppers. They totally made the sandwiches great. Too bad they've closed down. You can probably get a similar incarnation at the 3rd St. Promenade. There is a place there that does Middle Eastern food and its quite popular. Cathy, sorry about misspelling your name. For some reason I keep putting a K in it. Thanks for posting about Sultan. Good food at a decent price. We also like The Kebab Shop, a place you mentioned in a comment about Pho Saigon Star last summer. Both places are close enough to the ballpark that the evening can start with spicy meat and end in tears. A note: there are 162 regular-season games in baseball, and since the Pads have only played 41 and lost 26, there's a lot of baseball to be played yet, and the team is far from eliminated. They're only 10 1/2 games out of first. 3. About this time in 1987, your Tigers were 9 1/2 back (one less than my Padres) and, persevering, went on to win their division. Notwithstanding Commissioner Giamatti's lament: "It breaks your heart. It is designed to break your heart..."
Hi Jeffrey-I am always looking for Middle Eastern and Mediterranean foods when I travel to meet friends "up North" and will post some good finds from there also. It is just tasty as well as being healthy. Oh- and with your first name, I know you have had your share of misspellings in your life. I pretty much answer to anyone who seems to be looking at me and talking...no name or spelling involved. Hahaha, Omar- I am so glad you read every word of my posts...I knew someone might comment back. I know you know I am good with numbers and all, just wrote the post over the losing streak and all... I never posted on the Kebab Shop, did I? I kind of like Sultan a bit better. You should try it before a game also, although it is a bit more of a walk. I love shwarma and OMG your descriptions sound so good! Wish we had more around here, the two I in my lunch rotation have closed down. This reminds me that I need to hunt a new spot down. 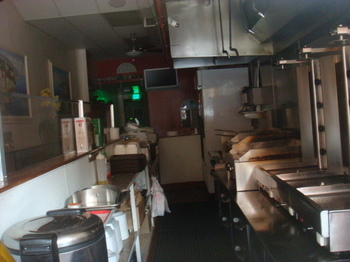 The post I mentioned was about Pho Saigon Star (28 May 2007). On August 17, you added the following comment:"... and on ninth just north of Market is a Kebab place." I assumed you meant The Kebab Shop, which we love. 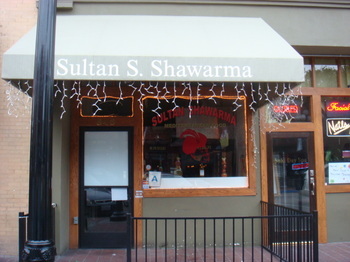 We also enjoy Sultan Schawarma, which is a pleasant stroll from our seats at Petco Park. I especially dig their Shish Tawk, or chicken kebab, which is fragrant, succulent and moist. Wishing this food was available in the ballpark, instead of Rubios-Anthonys-Oggis-generic-frickin-stadium food, I carry my Kebab Shop//Sultan Schawarma out and eat it during games. Take that, chain restaurants, and take THAT, Delaware North. I saw that this place was opening up awhile ago but I had forgotten about it. I'll definitely have to walk down and give it a try! I wish I had known that they were open earlier so that I could have told my Arabic class to have lunch there instead of Al Bustan's. I am not willing to spend $15+ on lunch. Haha. Great to read another of your posts. I know you must have been burned out after blogging almost daily while Kirk was on the other side of the world. In the "old country", there's little difference between shawarma and gyros. But we're here, not there, and while in the U.S. the method of getting shawarma meat to the bread/plate is similar to that used by gyro makers, the difference in flavor is remarkable. 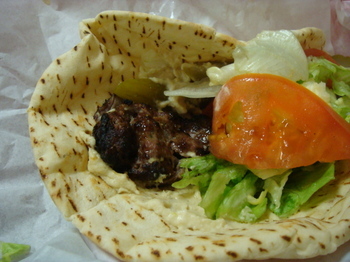 Authentic shawarma is made from good quality cutlets of beef, chicken, lamb, turkey, goat or combinations of these things. To the contrary, my dad ran a pizza/gyro shop in the Washington DC suburbs when I was growing up, and I never did figure out what animal died to make the gyro's mystery meat. "Minced beef" I've heard it called. Each layer of shawarma meat is spiced (and sometimes marinated), then it's skewered over the big spike you've seen in gyro shops, spun before a roasting coil or flame, and, as it's ordered, shaved into a large scoop and placed on the plate or in the sandwich. Think tacos al pastor, but since the dish's fanbase is predominantly Muslim, you're not likely to find pork shawarma. The appeal of this meat is such that I've seen other people... ok... truthfully, I personally have begged the carver - 'most every time - to cut just a little more meat, no matter how much he offered at first. Have it with the white sauce. No one will be able to tell you what's in that, either, but it enhances the dish. Hi Carol- I'm back! Isn't it interesting what we lost touch of and now remember from our High School days? The Kefta has its own spices and is good also. Find a place, FH...there has to be one somewhere. I can't imagine the whole ciy with noplace to eat something on a pita..
Hi again, Omar...I did recommend the Kebab Shop when you told me you were a season ticket holder. I just never posted on it. I tend to favor Schawarma now though...but the smaller hole in the wall places are where to go before or after a game. Locals frequent both...even when baseball is not in town. Oh, you will really like it JessicaH, even though it is teensy. The food is excellent. Hi, ed! I was burned out for so many reasons...AND still have remnants of the flu. This is a great place to eat. Ah, Billy-Omar kind of summed it up for me. If we did a side by side of just the meats, you could definitely taste the difference between Gyros and Schawarma'd beef and/or lamb and/or combinations, The bread and toppings are kind of the same, yes...but the flavors are different. I will go into more detail in another Mediterranean post. Oh, and I tried Hammurabi in El Cajon last weekend, and I can say plainly that I'd have been better off buying the meal's components and cooking them myself. If I had stayed to eat instead of taking carryout, I'd have sent it all back. Just nasty. Thanks Omar that was a great in depth on this type of food I appreciated it. I was thinking of al pastor by the way you were describing it. And thanks Kathy for the introduction to Schawarma. Hey, Bill- I did mention -but did not explain the schawarma sandwich at Ali Baba, which I posted while Kirk and The Missus were on vacation. I need to explain, and I will.